It was while a student at Saint Andrew’s School in Boca Raton that actor John Posey’s star was born. The 1968 George Plimpton/Alan Alda football film Paper Lion was being shot on campus, and Posey worked his way into a small role. Eventually he picked up the ball and ran with it to a 30-year career in TV, film and theater, scoring credits from Seinfeld to How to Get Away With Murder. His one-man play, Father, Son & Holy Coach, brings him full circle with its first Florida performances this weekend – at Saint Andrew’s, 7 p.m. Friday (4/28) and Saturday (4/29) and 2 p.m. Sunday (4/30). Portraying 20 different people in the 90-minute production, Posey has toured the country with the critically acclaimed show, which he also wrote, since its debut in 1993. 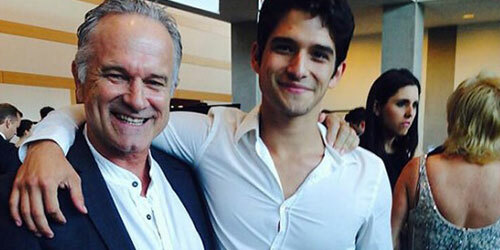 The play humorously focuses on a father-and-son relationship, and one of its co-producers is Posey’s real-life son, Tyler Posey, best known as Scott McCall on the MTV series Teen Wolf. He will join his father for the Boca shows. “This is a father-son story, and the production is a father-son endeavor,” Posey says.